The Park view Safari Lodge is one of the newly added Uganda Safari lodges in the destination of Queen Elizabeth National Park. Positioned in Kyambura Area, the Park View is mid-range or call it standard that is best placed to serve the middle income travelers on safari in Uganda. The lush en suite cottages are nicely placed in natural ecosystem setting crafted using natural materials and fitted with canvas that blends with the surrounding. 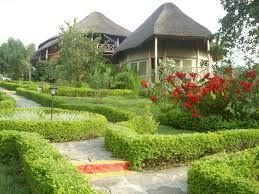 The cottages are thatched with local grass presenting cool atmosphere suitable for relaxation while on Uganda Safaris. The bath tubs and showers overlook the wilderness equipped with both hot and cold running water while the private wooden decks offer uninterrupted views of the park savannah while lighting by electricity. Park View Safari Lodge is considerably rich in facilities including restaurant with an extensive menu providing for both local and international food, Library and reading area where you can learn more about conservation and the Queen Elizabeth National Park in detail, gift shop where one can secure a souvenir to commemorate the Uganda tour, extensive swimming pool offering a deep bath after an extensive game drive, Laundry service, internet connectivity that keeps one connected in the outside world and well stocked bar. Besides the lush Cottages, Park View Safari Lodge also features well built rooms set with concrete materials providing a rather affordable accommodation to the price sensitive travelers on safaris and tours in Uganda. The guests in these rooms fortunately have access to the swimming pool, the restaurant among other facilities at Park view Safari Lodge. The lodge presents a good base to visiting the park and undertaking a myriad of activities including game drives in Kasenyi, Mweya peninsular, crater area and the excursion to Ishasha sector, river safari along Kazinga Channel, Chimpanzee trekking in either Kyambura gorge or Kalinzu forest Reserve and a forest walk in Maramagambo forest.